One of our themes was “Under the Sea” – submarines, fish, and coral reef. Here are some recommended books for preschool and elementary age kids about the ocean. Over in the Ocean: In a Coral Reef by Berkes and Canyon. This is an absolutely delightful book – perhaps one of my favorite kids’ non-fiction books ever. It’s so good that I wrote a whole post all about it and other books by the same author. There’s text set to a familiar tune you can sing, amazing illustrations, nice collection of facts, fun counting book. Highly recommended! Age 3 – 7. Fish, Swish! Splash, Dash! : Counting Round and Round by Suse MacDonald. A terribly clever design for a counting book. As you read forward in the book, it counts up from one to ten. Then when you reach the end, you flip it over and count down from ten to one. Nice illustration style, with cool see-thru die cuts that are intriguing in both directions. Age 3 – 7. Swim Fish! : Explore the Coral Reef by Neuman, a National Geographic reader. Age 2 -5. Very simple pre-reader non-fiction with gorgeous photography. Worth getting from the library just for the pictures. Coral Reefs by Gibbons. Age 6 – 9. Gibbons has written over 50 non-fiction books. They’re all full of great information, well organized, with colorful illustrations. It’s a reference book for the shelf more than it is something you’d sit and read in one sitting. 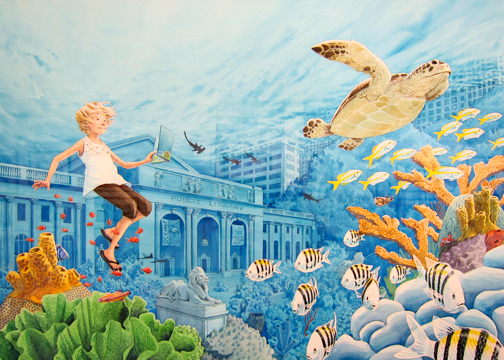 Coral Reef by Parker, from the Smart Kids series. Ages 5 – 8. Some people love the bright, dynamic graphic design. I personally find it visually overwhelming. It’s a little difficult to read when it highlights words in bright colors… sometimes they’re the most important words or vocabulary words – sometimes they seem chosen at random for highlighting. I might have it on the shelf to look at, but I’m not likely to read it to anyone. Sponges and Puffer Fish by Rake. Sea Turtles by Lindeen. All part of the “Under the Sea” series. 3 – 6 years. Basic introduction to the facts about sponges (or puffer fish or sea turtles) with more great photos. I like having books about some of the other creatures that make up an ocean environment, to get kids thinking about all the things animals can look like / be like. Each include a glossary and recommended books / websites for more info. Sea Bones by Barner. Each page has a line of big text that’s written for 4 – 5 year olds, and also has a paragraph of information written at an upper elementary to grown-up level.. I don’t love the kids’ text as a read-aloud…. it’s fine, but not great… “…there are animals without bones that drift with the waves. Some creatures cling to plants, rocks, or caves, A skeleton helps a speedy shark swim, fish shine down deep where the light is dim. Skeletons or not, there is much life to see. They all live together in the salty sea.” I do like the illustrations, particularly the ones that show “x-rays” of the creature’s skeleton, and I do like the chart in the back (common to many of Barner’s books) where there are 8 columns (for jelly, rays, clown fish and more) and 4 rows of facts: is it a fish, does it have a backbone, what kind of skeleton, and what does it eat. The Berenstain Bears Under the Sea by Berenstain. Ages 5 – 8. Like all …Bears books, it’s pretty wordy for this age group, but the characters / illustrations are fun and engaging, so they keep kids’ interests for that longer read. (But too long for a group circle, I find.) The family goes to the aquarium, then out to sea. Their host first shows them the birds that fly above the water (illustrations include seagulls, osprey, terns, and cormorants) and flying fish. Then the submarine dives, and we first see shallow water creatures (sharks, marlins, sea mammals) and coral reef inhabitants. They dive to deeper waters: sperm whale and giant squid, deeper to angler fish and gulper eels, then down to bottom dwellers: tube worms, and more. Good, accessible book. Mysteries of the Sea: How Divers Explore the Ocean Depths by Morrison. A National geographic chapter book, for ages 6 – 9. Great photos. A nice overview of the history of deep sea exploration covering diving helmets, aqualungs, bathyspheres and submersibles, with an engaging dramatic story to go with each. Note: the copyright is 2006, but the most recent invention / mission described was in 1986. Down, Down, Down: A Journey to the Bottom of the Sea by Jenkins. The concept is very cool – we start above the surface of the water with a bird, then “out of the water” where sharks, dolphins and flying fish appear, then the sunlit zone (73 degrees, 10 feet down) with mackerel and krill, sea turtles and rays. Then deeper, and deeper… to the dark zone 3300 feet below the surface, with deep sea jellies and angler fish. Then as far as the Marianas Trench, over 35,000 feet below the surface and the creatures that live there. Both the text and the concept though are way over the head of my students. The product details on Amazon say it’s for kids 4 – 7… I would say 6 to 9. Maybe with an adult reading one-on-one it would appeal to a younger child with an interest in ocean life. You can also find my recommendations for books about the beach, and books to go with a Sink-Float theme and a Submarines / Scuba theme.